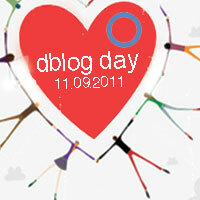 I have to branch out a bit for today's blog post because, not only is it day 9 of WEGO Health's National Health Blog Post Month, but Nov 9, 2011 also marks the 7th annual D Blog Day, hosted by Gina Capone at Diabetes TalkFest. The challenge for D Blog Day was something I didn't take the time to accomplish this year - which was to create a 12x12 scrapbook page. I had three reasons I didn't do it. 1. Shopping for scrapbook materials when you have no idea what you're doing can be overwhelming and is especially hard with a toddler in tow. 2. Putting together my first scrapbook page with Sweetie running around with my tape and scissors would prove exhausting. 3. We were supposed to include the words "I want a cure." I don't believe this disease will ever be cured. At least not for those of us who've already been diagnosed. And so I don't ask for one. For me to lament that there is no cure, I feel, is to waste the time that I could be living, doing, singing, writing, playing with my daughter. To beg the cosmos to cure me of something is to assume that there is a reason I have it and that if we just follow some rules and wait patiently, the cure will be revealed to some scientist finally. Nobody asked for this. We've all got to go on. We have to deal. It's not that I wouldn't get in line for one if it were found, and I know there are talented researchers working hard toward understanding diabetes, but I'm not going to hope for something I can't see on the horizon. That's not how my mind works. I don't sink money into it - I'd rather spend my money on my own diabetes management than on cure research. I don't usually ever even think about a "cure." When the human race cures anything, I'll be impressed. But we haven't yet. And there is a lot more we understand about the illnesses we can at least vaccinate against or send into remission. Diabetes' genesis is still so misunderstood that I think it's ludicrous to suggest we're "five years away," as they've been saying since the 70s. Which brings me back to my personal brand and the niche I fill in my community. I believe I stand for those that need to know what to do right now. How to live with diabetes. You and I both have to wake up every morning and deal with the reality of this. And I think I get that across. So I think I know how I'm viewed. My hundreds of friends in the Diabetes Online Community - 40 or so of whom I've had the joy of meeting in person by now - see me in much the same way that my close friends and students have always seen me, I think: maternal, creative, compassionate, empathetic, occasionally wise, occasionally funny. 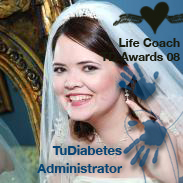 The members of TuDiabetes have twice honored me with member-voted awards - the "Life Coach" award in 2008 and the "Uncertified Diabetes Educator" award in 2009. I know that people trust that I will give my experience honestly, that I'm not afraid to share personal info, and that I genuinely want to help. -Her advice is always reliable, dependable, and on-target. She is so smart! I appreciate all the time she spends with us. 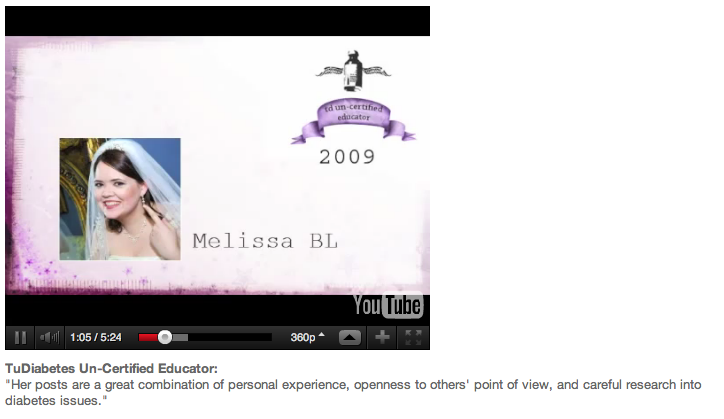 -Melissa's contributions are chockful of information. They are "meaty" and objective. She has contributed a lot to this community by sharing her experience, advice given to her over the years from her valued educators and her general knowledge of diabetes. There is no question she has done a lot of homework over the years and she knows her stuff! -Melissa shares valuable information almost daily:) Her practical tips on pumps, CGMS, etc. provided w/ kindness and support...have made living w/ my diabetes so much easier. I spent eighteen years doing diabetes all alone, thinking wrongly that I must be doing a horrible job because my blood sugars were not that of a normal non-diabetic person's. Once I discovered the D-OC, I realized that everyone felt that way. Everyone was overwhelmed, occasionally burnt out, thinking they were the odd man out. And I realized that I had this HUGE wealth of experience stored up that I could share. I was a veteran in the trenches. And thanks to my husband's support and a good medical team, I'd started to turn some things around. I was working on my Happily Ever After. But I'd been down, I'd felt sick, and I had been motivated to find answers. One of the things I love about this community of people is that we all know how scary, lonely, tedious, and thankless this condition can be. And we get out here and we say, "hey, I need someone to hold me up today." And suddenly the troops are rallied, advice is offered, hands are held, and we soldier forward. Finding support online ultimately changed how I viewed myself, my struggles, and this condition. In most areas of my life, I barge in and assume I'm wanted. Assume everyone appreciates my perspective. Assume I have a right to share it. I'm the girl in the elevator eavesdropping on your conversation and itching to give you my take on it, and probably my life story. I've got an anecdote and an analogy for just about every situation (ask my students). In the Diabetic Online Community, I've been lovingly accepted for those quirks. Instant family. Blood sugar is thicker than water. And to take one final turn in this post, I want to address the conversation I've been eavesdropping on this week concerning JDRF's controversial ad stating that "1 in 20" of us "will die of a low blood sugar." Because it directly relates to the hope for the cure I gave up on. I applauded the JDRF for the first time when, last year, they addressed issues of living with type 1 diabetes as part of their mission statement rather than narrowly focusing their efforts on cure research and fundraising. People like me who live in the now, in the disease - we were so thankful to have this media powerhouse working toward technologies that would make our management easier. Many parents of young children felt it was a distraction from JDRF's stated mission over the last few decades. Veterans like me breathed a little easier. This new ad, based on research that says that 5% of us will die of low blood sugars, aims to encourage the FDA to act more quickly in approving insulin pumping systems already available abroad that include LGS (low glucose suspend) - a feature that will shut off insulin infusion during a low blood sugar episode. I still can't bring myself to say "I want a cure," let alone immortalize it on fancy square paper. I think it makes me feel too vulnerable. But I have no trouble saying, yes, WE need a cure. Because I have to stop thinking about what I can handle myself and start thinking about how there's no one in that community I'm ready to say goodbye to. I would love to get together with them on Wednesday nights someday and reminisce about the condition we all vaguely remember having. 1 in 20. We've lit too many blue candles already.